The W4RA team at VU is proud to present three new master theses: by Justyna Kleczar (July 2017), Reshmi Sarkar (June 2017) and Jamila Daoudi (May 2017). Justyna Kleczar’s work is on speech technologies for underresourced languages. It comprises a new methodology, including very comprehensive tooling, which facilitates and allows development of new voice-based applications. These tools and methods are highly relevant ofr building voice-based applications (market information services, meteo information services etc.) for farmers in rural Africa, who communicate in underresourced languages such as Bomu, Bambara, Frafra, Moore or Mampruli. Justyna’s work will be used in further action-research in West Africa. Download Justyna’s thesis: [PDF]. Reshmi Sarkar explored whether conventional business modeling methodologies are capable of fully capturing the complex socio-economic relationships, that exist in ICT4D business contexts. In her thesis, a new construct of “Community” is proposed in the e3 value ontology, which conventionally only consists of “customer”, “market segment” or “enterprise” as common economic entities in a value web. The proposed improvements by Reshmi will enable to capture various socio-economic relationships which are commonly overlooked in conventional business modeling methods. Reshmi’s work may be the start of a new way of understanding ” business” in low resource contexts, such as e.g. rural Africa. Download Reshmi’s thesis: [PDF]. Jamila Daoudi presented several scenarios for ICT and non-ICT-based value webs in rural Mali. She showed how the introduction of new ICT technologies may influence the existing local business and lead to alternative value webs, offering new opportunities for local business, including e.g. community radio stations, village reportes and other local enterpreneurs. 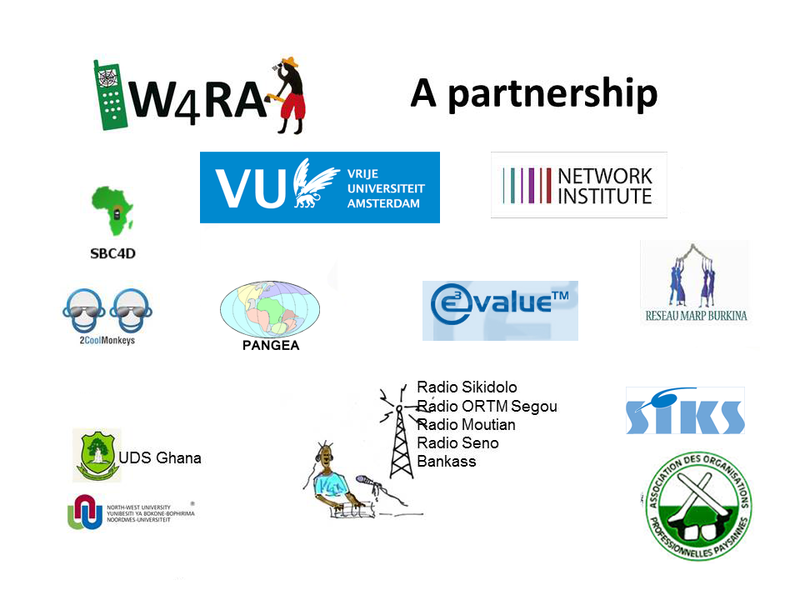 Jamila also shows how, in the absence of a local alternative, inexpensive data and communication infrastructure in rural Africa, the international network operators and other large businesses (media concerns, large advertisers etc) will remain the biggest beneficiaries of ICT4D. The relative high prices charged for local low-resource customers of international ICT infrastructure and services continue to hold back local innovation. Download Jamila’s thesis: [PDF]. This makes a strong case to work towards more decentralisation of the Web (Web extensions) by trying to avoid expensive international ICT infrastructure, when building ICT services for local business and information sharing in low resource environments. W4RA research will continue on various themes and aspects related to the results of these three theses in the near future. Related work has recently been published on how to make the World Wide Web really inclusive.